Who can park in accessible parking spaces? A “Disabled Veteran” license plate. License plates with the symbol of accessibility are available for no extra cost, however, the Department of Motor Vehicle charges $3 for a “disabled veteran” license plate and $5 for each temporary parking placard. There is no charge for a permanent parking placard. Individuals can receive up to two parking placards, or one license plate and one parking placard. Placards for people with permanent disabilities expire after four (4) years. License plates are available for motor vehicles with a capacity of two tons or less. License plates are valid as long as the person owns the vehicle. Plates should be removed from the vehicle when it is sold. An individual may receive additional license plates for each vehicle they own that is modified to accommodate a disability. Individuals with foreign or out-of-state parking placards or license plates can park in accessible parking spaces in Texas. Texans can also use their placards or license plates to park in all other states as well. 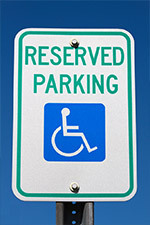 Texas law provides that a vehicle may be parked for an unlimited period in a parking space that is designed specifically for persons with physical disabilities if the vehicle is being operated by or for the transportation of a person with a disability, and if the vehicle displays the appropriate plate or placard. Texas law also provides that a vehicle operated by or for the transportation of a person with a disability and displaying the appropriate plate or placard may park for free at a parking meter for an unlimited time. However, Texas law no longer allows individuals with disabilities who display a plate or a placard to park for free at government-owned parking lots (such as at airports or parking garages) unless the government entity passes an ordinance allowing such free parking. Texas law allows individuals to park using placards and plates from other states and foreign countries; and Texas placards and plates are recognized by all other states. Texas law allows parking placards to be removed and displayed in any vehicle used for transportation of a person with a disability. People with disabilities can apply for placards even if they do not own a car. To park a car in such a way that it blocks access to an accessible parking space, an access aisle, or any architectural improvement that provides access for people with disabilities, such as a ramp or a curb cut. Violations of these laws are punishable by the seizure of the parking placard and by fine. How do I apply for a special license plate or parking placard? Obtain the proper form.Individuals who wish to apply to receive plates and/or placards must fill out Texas Department of Transportation form VTR-214. The form can be obtained from the County Tax Assessor/Collector’s Office, and is also available online at the TXDMV Website. Complete the appropriate sections of the form. Choose the type of placard and/or plate you’re applying for, and then provide your name, signature, driver’s license or identification card number, the date, and your address. If you’re applying for license plates, fill out the information about your car. Do not fill out the physician portion of the form. Visit your physician or podiatrist. A physician or podiatrist must complete and sign their portion of the form. The physician or podiatrist must be licensed in Texas, Arkansas, Oklahoma, Louisiana, or New Mexico, or else be an employee of the Veterans Administration. The signature must be notarized unless the physician or podiatrist attaches a separate written original prescription on a prescription form or on his letterhead. A podiatrist may complete the form only if the applicant has a disorder of the foot that limits mobility. Return the form to the County Tax Assessor/Collector in the county where you live. If your plates or placards expire, or are lost or stolen, you must complete a new form. However, people with permanent disabilities do not have to have a physician sign subsequent forms.